Designer Byron Lars took a different approach for his spring 2016 fashion presentation. Instead an impersonal runway show, he opted for a very intimate gathering with select bloggers to share his collection. Proving his clothes look great on ALL women, his small squad of models included women of different sizes, ethnicities, and ages. The fans who were wearing his work in attendance also represented the above. Media figure Teri Agins and author of Hijacking the Runway hosted a conversation with Byron Lars to discuss his inspiration behind spring 2016. This season it was a mix of textures that included power mesh, laser cut fringe, lace, ultra suede and brocade. Silhouettes had its roots in classic Haute Couture like Dior's New Look. Unique details included stamped brass insects and birds. Agins pointed out the interior details of Byron Lars pieces that most people don't see, like horsehair lining the hems to create a flared shape, built up collars or surprise linings that are removable. Those details are often my favorite part of his clothing. I swear some of Byron Lars dresses practically stand up on their own. I helped work on the introduction of his newest details. These were space age inspired silicone appliques (I think he wished I hadn't after the first few rounds). They were a labor of love that ranged from 3D rendering, printing, molds and many other steps. In the end, the result looked fantastic. There were cheers when he announced he was launching the plus size division of his label. Full figured model Liris Crosse modeled a stunning white sheath with lace and sequin embroidery. She explained that she loved the dress because of all the internal structure to support her curves. 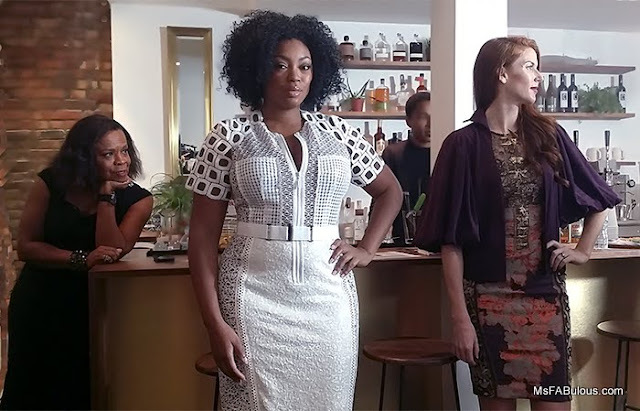 She appreciated the design because it was very rare to see dresses for the plus sized fashion range created with so many details and thought (we all know the shapeless tunics other brands produce). Lars had always wanted to extend his size range (it currently goes to size 12) to serve more of his fans. He admitted he took it to heart when he put out a social media post as a fan of Jill Scott and someone responded that if he was a fan, why wouldn't he make clothes that would fit someone like her? He is committing himself to really perfecting the fit and consulting with women in the size range to put out something worthy of the full figured customer. Byron Lars understands that you can't just size up a smaller size to serve the curves, so he will be developing his pieces specifically for this size range, fit with plus sized models. If you are looking for truly special fashion pieces for spring 2016 you can collect, I can't think of better work than that of designer Byron Lars.